Those with taxable incomes up to ₹5 lakh would be the happiest from the interim budget presented by finance minister Piyush Goyal on 1 February as the government has proposed atax rebate of ₹12,500 for that income level. However, it had a little bit of good news for all taxpayers across the low-, middle- and high-income spectrums. Goyal said the government’s tax reforms over the past four and a half years had resulted in significant improvement in tax collections as well as the tax base and that’s why it was only fair that some benefits were passed on to the taxpayers. Tax collections increased from ₹6.38 trillion in 2013-14 to almost₹12 trillion this financial year, while the number of returns filed increased from 3.79 crore to 6.85 crore in the same period, he said. We tell you what the interim budget—the last before the general elections—means for the low-, middle- and high-income groups. The budget highlighted the importance of providing social security to lower income groups and tax relief to small taxpayers. Accordingly, the big-bang announcement was a pension scheme named Pradhan Mantri Shram-Yogi Maandhanfor unorganised sector workers and a tax rebate of ₹12,500 that ensures that individuals with a taxable income of ₹5 lakh pay no income tax. Tax rebate: Contrary to what many believed, the finance minister didn’t increase the exemption limit—the amount of income not liable to tax—but increased the rebate from ₹2,500 to ₹12,500 for taxable income up to ₹5 lakh. A rebate is a subtraction from the net tax you are liable to pay. Given that individuals with a taxable income of ₹5 lakh need to pay a tax of ₹12,500 and the rebate is equal to that amount, they wouldn’t need to pay any tax. Nevertheless, they will need to file their income tax returns. 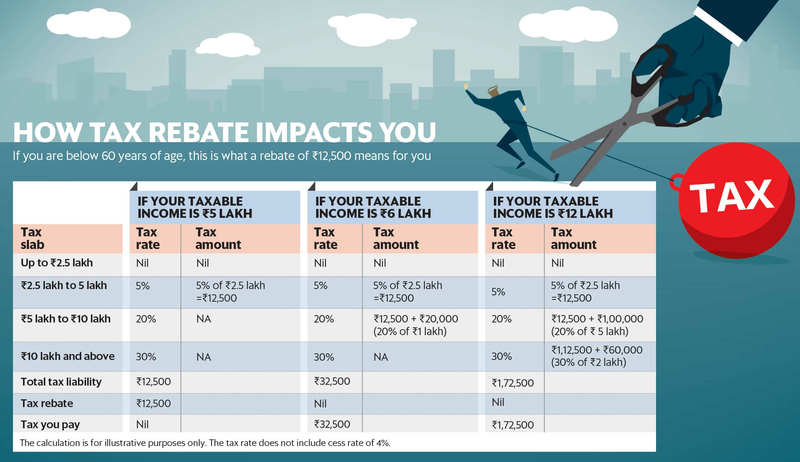 Also, it is important to note that the rebate is not applicable to those with taxable income above₹5 lakh (see graph). 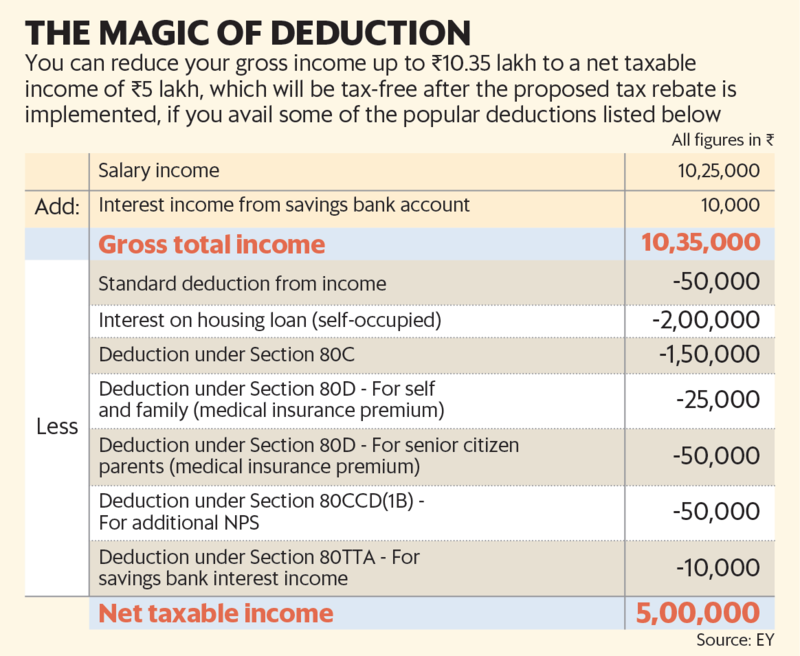 The rebate, theoretically, is restricted to those with incomes up to ₹5 lakh, but in spirit you can stretch it to higher incomes by factoring in the available deductions. Deductions help you bring down your taxable income. The first deduction to consider is the standard deduction that the budget proposes to increase from ₹40,000 to ₹50,000. So for someone with a salary of ₹5.5 lakh, considering a standard deduction of₹50,000 the taxable income comes down to ₹5 lakh. Spread the deduction net wider and factor in popular deductions and even individuals with an income of ₹10.35 lakh can reduce their tax liability to zero (see graph). Pension scheme: The mega pension scheme that the budget announced for the unorganised sector is meant for workers with monthly income up to ₹15,000. It will provide these workers a monthly pension of ₹3,000 from the age of 60 years. While the workers will have to make monthly contributions towards this scheme during their working age, the government will also put in an equal sum in the accounts. “An unorganised sector worker joining pension yojana at the age of 29 will have to contribute only ₹100 per month till the age of 60. A worker joining the pension yojana at 18 will have to contribute as little as ₹55 per month," said Goyal in his speech. The pension money will be directly transferred to the bank accounts of the beneficiaries. “The basic design of the new pension scheme is similar to Atal Pension Yojana, but there is a matching contribution from the government. The long-term financial sustainability needs to be assessed," said Ritobrata Sarkar, head of retirement, India, Willis Towers Watson. As per Sumit Shukla, chief executive officer, HDFC Pension Management Co. Ltd, the new pension scheme is likely to come under the labour ministry and may negatively impact Atal Pension Yojana. “The correct scheme should ideally come under PFRDA (Pension Fund Regulatory and Development Authority), but the issue will be getting people to enrol," he said. The increase in standard deduction from ₹40,000 to ₹50,000 for the salaried class will help individuals save some more tax. For instance, a person in the highest tax-saving bracket of 31.2% will save ₹3,120 more in taxes in FY20 (see: You will get to save more tax in FY2019-20). Also, as illustrated earlier in the story, even those with incomes up to ₹10.35 lakh will be able to avail the ₹12,500 tax rebate and pay no taxes if they make use of all the popular deductions and bring down their taxable income to ₹5 lakh. “People with higher incomes may also be encouraged to use the deductions to bring their taxable income to the level where they can make the best use of the rebate. This will be a good trend since this will lead to greater financial prudence on the part of the individual," said Amit Maheshwari, partner, Ashok Maheshwary and Associates, LLP, a chartered accountancy firm. Another proposal that is likely to work for mid-income individuals is increase in the limit at which TDS becomes applicable on interest income on fixed deposits with banks and post offices. TDS will now be deducted only on interest income above ₹40,000 from deposits against ₹10,000 earlier. “At this higher limit many small deposit holders will now be spared the inconvenience of going through the exercise of providing 15G/15H forms as applicable to avoid having tax deducted on the entire interest income and then waiting for a refund," said Maheshwari. The budget has some sops for those in the higher income brackets too, primarily on the real estate front. The most significant one is that now you can reinvest your long-term capital gains into two residential houses and not just one as is allowed currently under Section 54 of the Income Tax Act, provided the gains do not exceed ₹2 crore. The reinvestment needs to happen within a specified period. However, if the profit or capital gain made is more than ₹2 crore, the old rules will apply and the individual can claim benefit only on the purchase of one house. Dilshad Bilimoria, director, Dilzer Consultants Pvt. Ltd, isn’t sure if the provision will excite many of her clients. “The trend is towards financialization and away from physical assets. Given the low yields on real estate investments and the issues associated with managing real estate investments we would consider the option of investing the gains in section 54EC bonds for the 5-year period rather than take on more physical assets," she said. The other benefit is the extension of the self-occupied property tag to two houses. From a tax perspective, there will be no notional rental income calculated on the second property and added to your total taxable income now. However, the deduction on interest paid on home loans will remain restricted to ₹2 lakh for both properties put together. This budget has given some options to taxpayers to save more taxes. How best taxpayers can use these will depend on their individual financial situations.